Magento Go is a cloud-based, web-hosted eCommerce software, the best option for small businesses who have just started their journey as online retailers. It offers all necessary functionality for setting a website store from scratch. Focusing on starting retailers with moderate programming knowledge Magento Go offers lots of useful features which make it stand out on the market of shopping cart software. In this article we will highlight the advantages of Magento Go solution and will offer different enhancements for hosted Magento based websites. 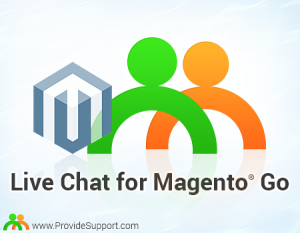 Though Magento Go has limitations on source code editing and integrating third party applications, it is still possible to add some enhancements which will help to improve customer engagement. With growth of your business it will be important to introduce a new strategy and reinforce your website with new tools for better customer engagement. Developing the strategy targeted to excellent customer service and equipping your online store with the right tools is the straightest road to success. Live Chat has become a modern communication trend recently. More and more customers start looking for a live chat button on a website when they have questions. Live Help assistance became a must have for most online retailers today as it allows offering the same service level as in brick and mortar shops. Provide Support Live Chat software provider offers the detailed guide for Magento Go and Live Chat integration. With help of this tutorial you will quickly add the live chat button to your online store. Integrate GA tool with your website to gain a better insight into your marketing campaign and analyze your traffic. Magento Go knowledge base offers clear and detailed tutorial for Google Analytics tool integration. CloudGento™ offers cloud based CRM integration opportunities for Magento users. This solution is the first 100% native integration between Magento and salesforce.com and allows managing customers data in an efficient manner. Each of these integrations will help to better assist your customers, increase sales and improve customer satisfaction and retention rates. Here at Provide Support we put a high priority on excellent customer service, chat with us to see how we do this. This entry was posted in Articles, Tips and Tricks, Tutorials. Bookmark the permalink. magento is one of great open source for eCommerce.